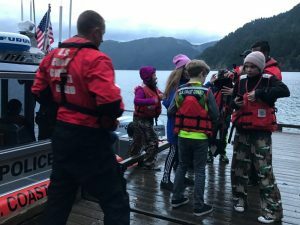 Students and chaperones from Stevens Middle School in Port Angeles, Washington were rescued from Camp David Jr. on Crescent Lake by the U.S. Coast Guard on Friday, October 14th. According to the Coast Guard, Sector Puget Sound received a call at approximately 3:45 p.m. reporting that 40 kids and 6 adults were stranded without power in a cabin at the popular Clallam County Camp. Due to high winds and fallen trees, David Junior Road was impassable by vehicle, blocking all access to U.S. Highway 101. The Coast Guard responded quickly, assisted by deputies from the Clallam County Sheriff’s Office. “With that amount of kids there, and the fact that emergency services could only get to them by boat, the decision was made to go out there and boat them over before the major storm hit on Saturday,” said Clallam County Chief Criminal Deputy Brian King. The maximum capacity of the Coast Guard vessel, a 29-foot Response Boat, was eight, therefore multiple trips were required to safely transport all students and chaperones from the northern shore to the Storm King Ranger Station on the southern shore. With a round trip of approximately 50 minutes, the rescue was not completed until 10:30 pm. Weather conditions were fair during the transportation process, with only minor wind. All teens and adults were transported safely, with no injuries or medical emergencies reported. According to the National Weather Service, between noon Thursday and noon Saturday, the Olympic Peninsula received copious amounts of precipitation. Forks saw 3.69 inches of rain, Port Angeles 1.15 inches, Port Townsend 1.33 inches, and Sequim 0.33 inches.